Arsenal fans have thought up a new nickname for the deadly emerging strike partnership between Pierre-Emerick Aubameyang and Alexandre Lacazette. The duo were on hand this afternoon to cause Cardiff’s defence a whole host of problems. Aubameyang scored Arsenal’s second of the afternoon in the 62nd minute of the game after being teed up by partner Lacazette following some great build up play by misfit Mesut Ozil. Lacazette also got in on the action scoring the winner for Arsenal in the 81st minute of the match, substitute Lucas Torreira slipped Lacazette in who fired the ball straight into the top corner. 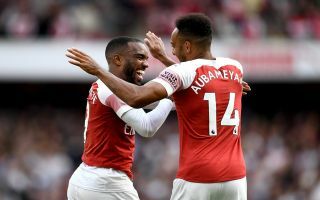 The finishing on display this afternoon from Lacazette and Aubameyang should hold the Gunners in good stead as they look to rejuvenate themselves under new manager Unai Emery – following a decline in recent years. Emery and Wenger seem to be the only ones who don’t see how well Lacabameyang play together. @UnaiEmery_ That's what LacaBameyang gets you!!! that's exactly why I want to see them up top together. Amazing stuff from Laca and Auba. Laca & Auba up top from now on. We all see it. The strike force of Laca/Auba deserves so much more than the shite they play with. Both genuinely world class. This afternoon was the first time the deadly duo have started a game under new Arsenal manager Unai Emery. The Gunners definitely looked as though they benefitted from some much needed added firepower at the top of the pitch.